My sister rang the other day and said she wanted to make our Aunty Jean’s Easter Wreath Cake. She asked if I could convert the recipe to use dry yeast and metric measurements for her. She suggested that I make it, too. I converted the recipe for her and, in the process, was searching the web to see whether bread flour or plain flour (cake flour) was more appropriate. (I went with cake flour but would be interested in anyone else’s opinion.) Most of the hits I got were for Eastern European Easter Cakes. This wasn’t helping me much as their flour is different from ours so I chose ‘Australian Sites Only” in Google and, would you believe it? I found the exact recipe at the website, “Old Aussie Recipes”. Here is a link to the site. The site doesn’t state the source of the recipe. My Aunty, if she were alive, would be close to 100 and had been making this recipe most of her adult life. It is interesting that there is an old Australian recipe for a cake that is of eastern European tradition. I’m thinking that it may have been brought over by the Germans who settled in the Barossa Valley in South Australia. Warm ½ cup of the milk to about 40˚Celsius (so that when you put your finger in it, you can’t tell much difference between the temperature of your finger and the milk). Combine the sugar, the dried yeast and the ½ cup of warmed milk – let it stand for 10 minutes. Sift the flour and salt together in a large bowl. Heat the balance of the milk and butter in a small saucepan until butter has melted – cool to about 40˚Celsius. Beat the egg and add it to the milk and butter mixture. Make a well in the centre of the flour and add the liquids. Mix to combine. Knead dough: either by hand – for 10 minutes or so until dough is smooth and elastic; or by mixer – on medium speed for about 4 minutes. Spray Glad Wrap with oil and water. Cover bowl, leave in a warm place until it doubles in bulk – about 30 – 50 minutes. Preheat oven to 200˚ Celsius. Turn out dough and gently stretch into a long rectangular shape and spread with the filling. Moisten edges and roll up. Twist like a rope and ease into a greased and floured 23cm ring tin. Cover with Glad Wrap and stand in a warm place for 10 – 15 minutes. Bake for 30 -35 mins. Reduce heat to 180˚ Celsius after 20 minutes if cake is browning too quickly. Boil sugar and water together for 3 minutes. Brush over wreath cake whilst it is still warm. Sprinkle with chopped nuts and cherries. 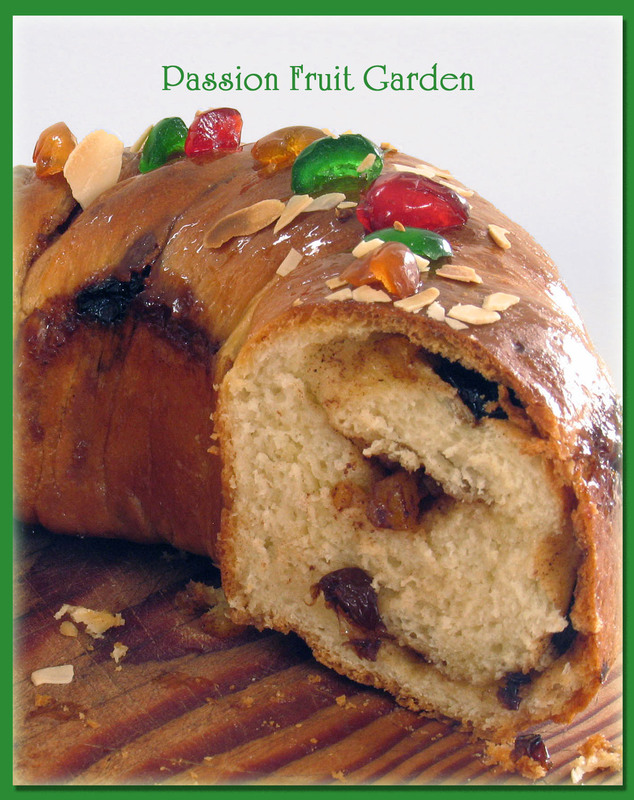 This entry was posted in Bread, Commercial yeast, Family favourites and tagged Easter, Easter Cake by Glenda. Bookmark the permalink. Thanks. It’s nice to make something that has family signficance, isn’t it? Hi Glenda thinking of trying the E W Cake to take to June and Greg’s on Monday. The picture jolts memories and makes my mouth water. Like I said in the post, use the extra milk. Bake at 200 degrees and check after 30 minutes – it should be ready. It is best eaten on the day it is baked so make it Monday morning. Let me know how it turns out. I hope it is as good as your mum’s. Yes it was, but a bit big for two people. We had it warm from the oven and for breakfast this morning. The rest is in the freezer. Hi Misky – Thanks it was pretty good. Looks yummy! Hope you have saved some for me! Unfortunately, it will be stale by then. How did your hot cross buns go? 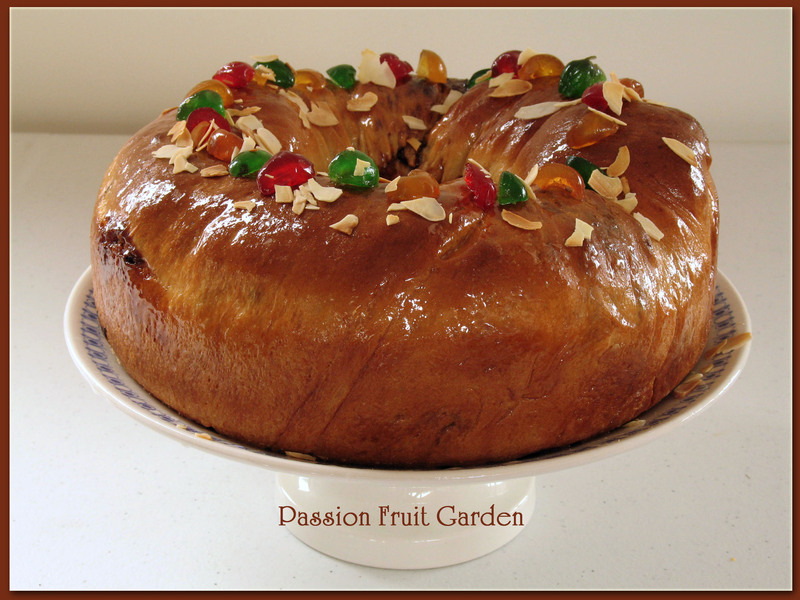 Happy Easter to Passion Fruit Garden followers. I do like the way you incorporate a colour from the photo in your border, most effective. It’s great seeing you enjoy it so much with your cooking and blog!!! What was that “work” word again!! !